US interference in the internal affairs of countries around the world has brought neither peace, nor democracy, said Russia’s Deputy Defence Minister Anatoly Antonov. He says the growing military presence of the US in the Asia-Pacific region considerably exceeds the level required to neutralize any existing or potential missile threat. The US is bringing instability to the Asia-Pacific region under the pretext of – specifically – a North Korean nuclear threat. Antonov called on the US to “give up double standards in the implementation of counter-terrorist measures” and stop dividing terrorists into good and bad ones. A classic example is the Taliban in Afghanistan, created to combat the Soviet Union, but which ended as the Al-Qaeda terrorist network that [supposedly] bit back hard at the US. Of course, Antonov mentioned the Ukraine in this context. 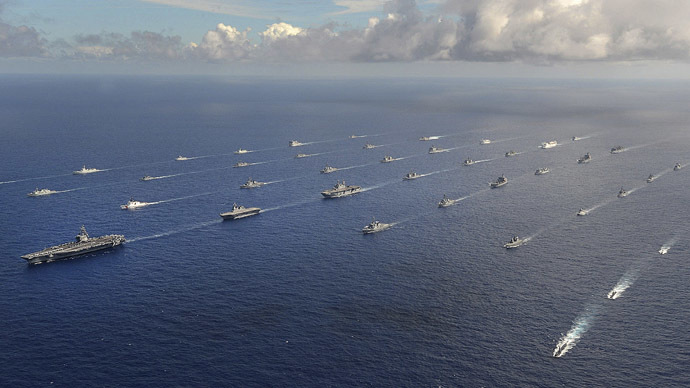 More than 40 ships and submarines representing 15 international partner nations travel in formation in the Pacific Ocean during the Rim of the Pacific (RIMPAC) 2014 exercise in this U.S.